Ken Johnson leaned across his desk and opened the palm of one hand. 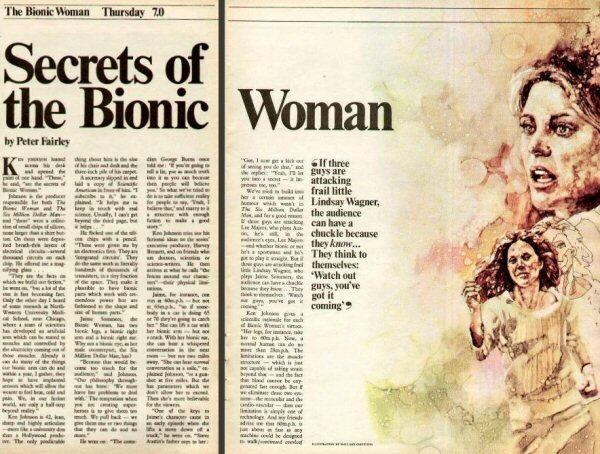 "These," he said, "are the secrets of Bionic Woman. "They are the facts on which we build our fiction," he went on, "but a lot of the rest is fast becoming fact. Only the other day I heard of some research at North Western University Medical School, near Chicago, where a team of scientists have developed an artificial arm which can be mated to muscles and controlled by the electricity coming out of those muscles. Already it can do many of the things our bionic can do and within a year, I gather, they hope to have implanted sensors which will allow the wearer to feel heat, cold and pain. We, in our fiction world, are only a half-step beyond reality. Ken Johnson is 42, lean, sharp and highly articulated - more like a university don than a Hollywood producer. The only predictable thing about him is the size of his char and desk and the three-inch pile carpet. A secretary slipped in and laid a copy of Scientific American in front of him. "I subscribe to it," he explained. "It helps me to keep in touch with real science. Usually, I can't get beyond the third page, but it helps..."
He flicked one of the silicon chips with a pencil. "These were given me by an electronics firm, They are 'integrated circuits'. They do the same work as literally hundreds of thousands of transistors, in a tiny fraction of the space. They make it plausible to have bionic parts which work with tremendous power but are not fashioned to the shape and size of human parts." Jaime Sommers, the Bionic Woman, has two right legs, a bionic right arm and a bionic right ear. Why not a bionic eye, as her male counterpart, the Six Million Dollar Man, has? "Because that would become too much for the audience," said Johnson, "Our philosophy throughout has been: "We must leave her problems to deal with." The temptation when you are creating super-heroes is to give them too much. We pull back - we give them one or two things they can do and no more." He went on: "The comedian George Burns once told me: 'If you're going to tell a lie, put as much truth into it as you can because then people will believe you.' So what we've tried to do is to taek sufficient reality for people to say, 'Yeah, I can believe that,' and marry to it a structure with enough fiction to make a good story." Ken Johnson tried out his fictional idea on the series' executive producer, Harve Bennett, and on friends who are doctors, scientist or science fiction writers. He then arrives at what he calls "the fences around our characters" - their physical limitations. Jaime, for instance, can run at 60m.p.h. - but not at 65 m.p.h., "so if somebody in a car is doing 56 or 70 they're going to catch her." She can lift a car with her bionic arm - but not a truck. With her bionic ear, she can hear a whispered conversation in the next room - but not two miles away. "She can hear normal conversation at a mile," explained Johnson, "or a gun shot at five miles. But she has parameters which we don't allow her to exceed. Then she is more believable for the viewers. "One of the keys to Jaime's character came in an early episode when she lifts a stove down off a truck," he went on. "Steve Austin's father says to her "Gee, I sure get a kick out of seeing you do that," and she replies: "Yeah, I'll let you into a secret - it impresses me, too." We've tried to build into her a certain amount of humour which was in The Six Million Dollar Man, and for a good reason. If three guys are attacking Lee Majors. who plays Austin, he's still in the audience's eyes, Lee Majors - and whether bionic or not he's a sportsman and he he's got to play it straight. But if three guys are attacking frail little Lindsay Wagner, who plays Jaime Sommers, the audience can have a chuckle because they know... They think to themselves 'Watch out guys, you've got it coming'"